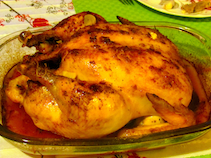 Lemon roast chicken, perfect juicy, flavorful, tender, falling off the bone chicken is one of my absolute favorite meals to cook. Remove the chicken giblets. 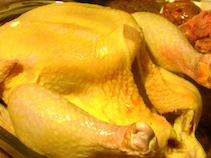 Rinse the chicken inside and out, pat it dry with paper towels. Place the chicken in a roasting pan. Sprinkle salt and pepper the inside of the chicken. 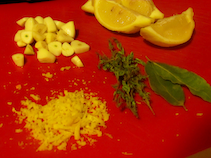 Stuff the cavity with the oregano, all the garlic and lemon. 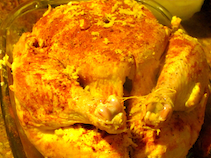 Rub the outside of the chicken with butter, pour over the lemon juice, season with salt, pepper, paprika and sprinkle with lemon zest. Tie the legs together with kitchen string. Pour in the pan wine, water and bay leaves. 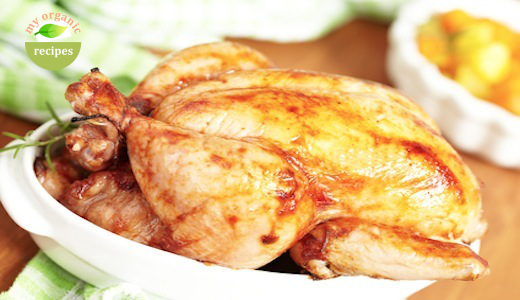 Roast the chicken for 1 ½ hours. Transfer to a platter and serve it with Golden Beets and Sweet Potatoes Salad.